That’s right we got a puppy! Jo Jo is a blue heeler puppy and he is as smart and adorable as they come. Jo Jo is 9 weeks old and it became obvious pretty quickly that pets have a lot of stuff! 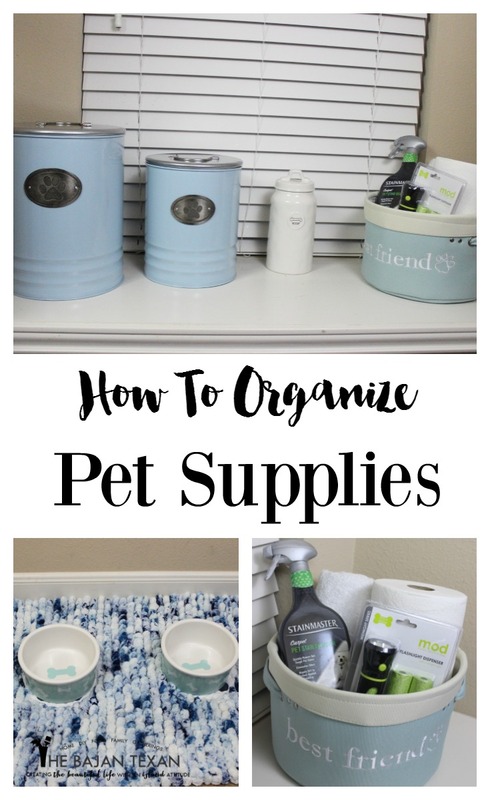 So I’m going to show you how to organize pet supplies and how I keep my house clean and smelling fresh even with a new puppy. Meet Jo Jo! The twincesses have been loving having a new puppy. 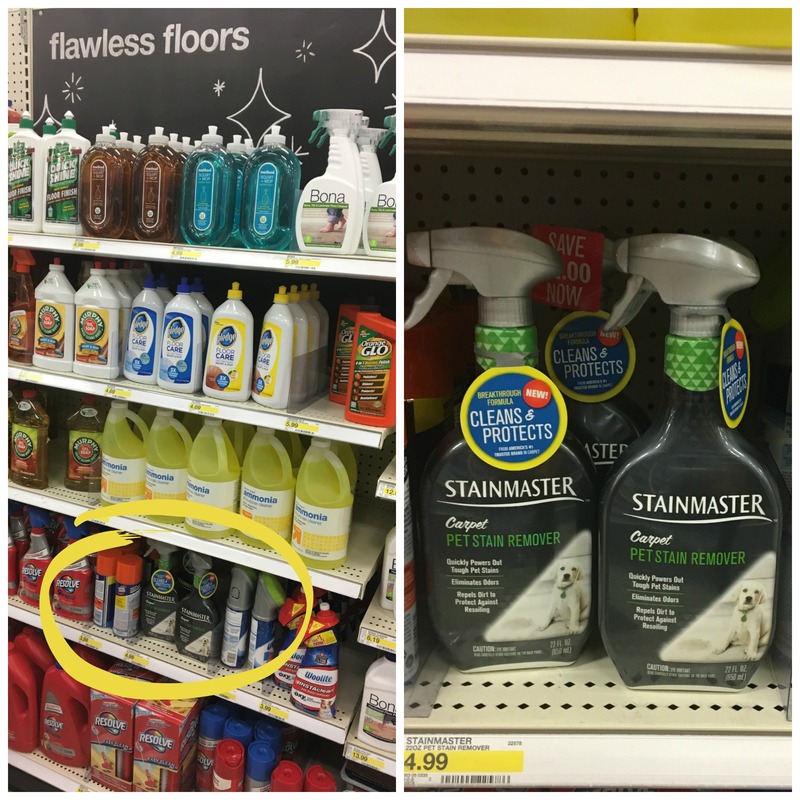 STAINMASTER Carpet Pet Stain Remover is not available at all Target locations, so if you don’t see it at your local Target store you could always just get it online. Click here to here to find STAINMASTER Carpet Pet Stain Remover, you can even have it shipped for free, to your local Target store. STAINMASTER Carpet Pet Stain Remover not only removes pet stains, cleans and protects my carpet but it has ODOR REMOVE™ Technology that eliminates odors! Hallelujah! The day our puppy got his 8 week shots, he was sick the entire night I’m talking urine, vomit and feces…at the same time. I was so happy I had prepared for my new puppy. STAINMASTER Carpet Pet Stain Remover was a life saver that day, and because I also have twincesses, they are essentially like 5 year old puppies anyway, I discovered that it works well on other stubborn stains like grape juice, ketchup and chocolate syrup stains too. I also like that it doesn’t leave any sticky residue behind on my carpet either, and because its STAINMASTER it actually helps to repel future stains, which is great because it seems that Jo Jo has a ‘spot’! So since cleanups are eminent and ongoing at our house, I decided to let JoJo have his own corner of the breakfast nook where we would store and organize pet supplies. I figured if everything is kept in the same place I can maintain some order and keep all his pet supplies organized. 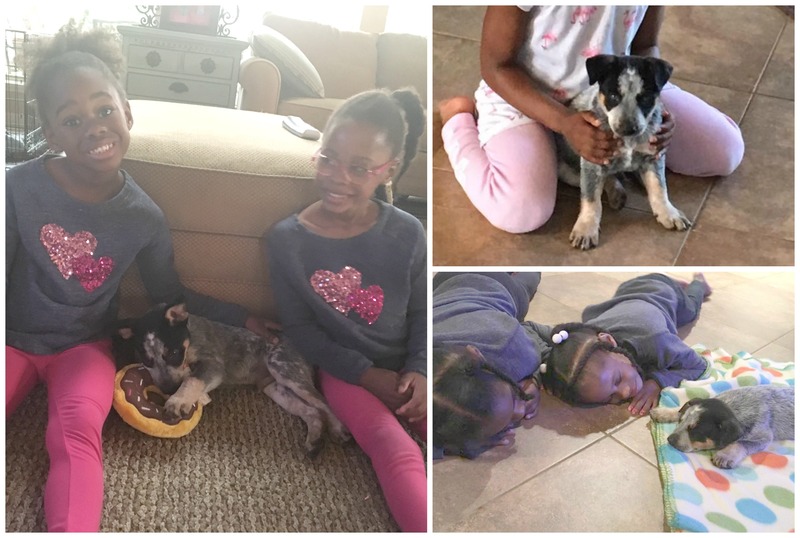 Also because cleaning up is such an essential part of having a new puppy, I wanted a place where even my five year old twins could go to help clean up and do their chores like feeding, walking and cleaning up after their new dog. So this is Jo Jo’s Nook! First off everything is blue to match with the color scheme of our home. 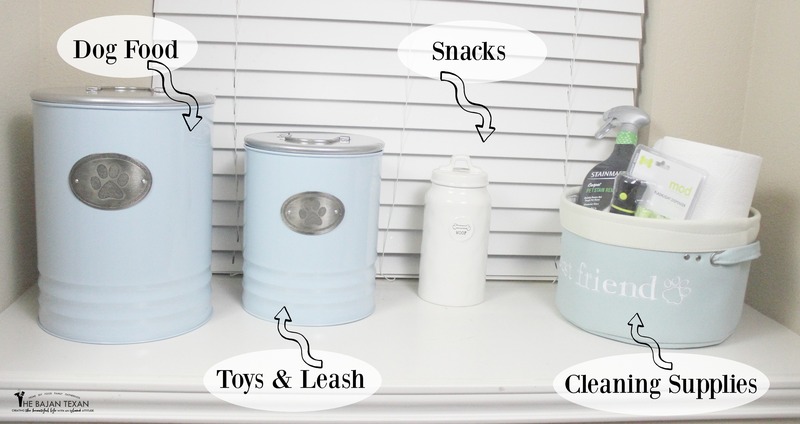 We organize pet supplies in 3 canisters, the large canister holds the puppy food, it also has a scoop so the girls are able scoop out the correct amount of dog food every time. The second canister holds Jo Jo’s toys and his leash. This is great because it is right by the back door and Jo Jo knows he is about to go outside and go for a walk or play fetch every time we go into that canister. The third canister holds Jo Jo’s training treats, so every time he obeys a command like sit or on the rare occasion he actually pees outside, he gets a treat. 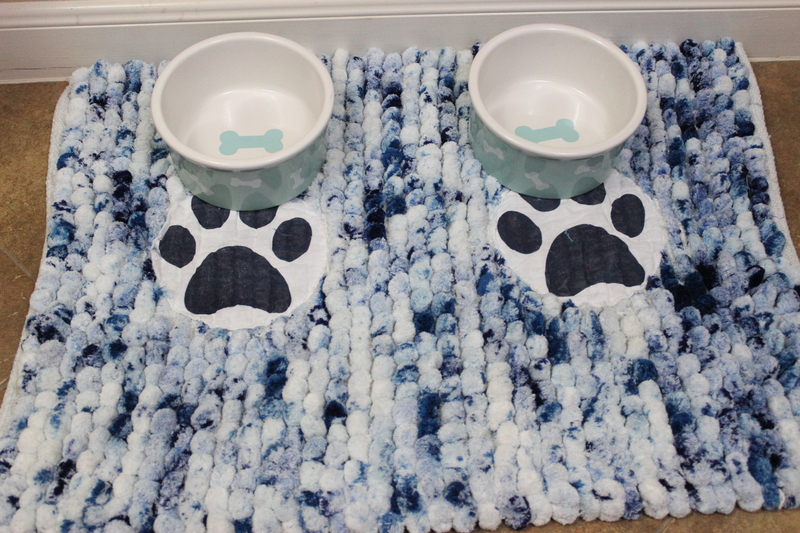 He has his bowls on a cute mat that has paw prints where the bowls go, I love that because it prevents the bowls from moving around while he eats. Then we have my favorite the cleaning basket. This is an essential for any new puppy owner. 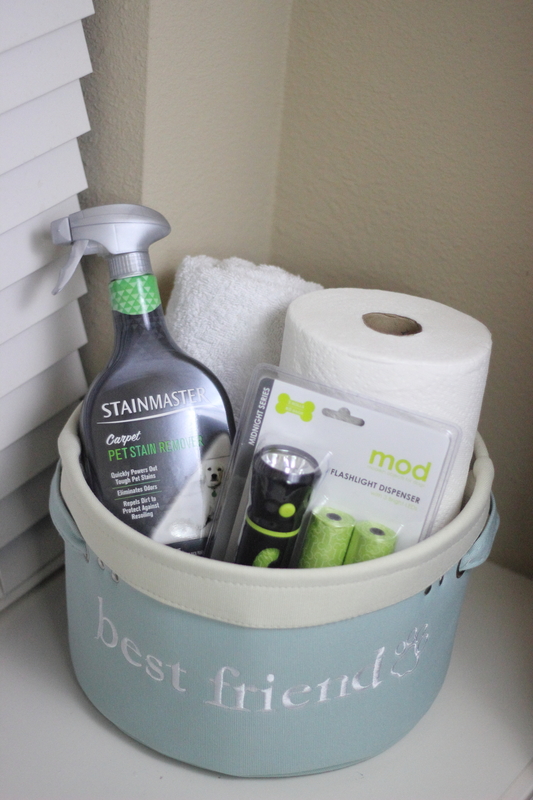 It contains STAINMASTER Carpet Pet Stain Remover, paper towels, my homemade all purpose cleaner (vinegar and water) for non carpet messes, old towels for big clean up jobs, a flashlight and bags. I know what you are thinking, what’s with the flashlight right? Anyone who has even stepped in dog urine knows, its kind of hard to see where the mess is on your floor, that’s where the flashlight comes in. The poop bags allow us to bag up all the messes so the smell is contained and can be taken outside immediately. What I love most about the cleaning basket, is that my girls think its fun to clean up messes from the basket. It makes the chore fun when they can use the flashlight and they already know how to wait and then blot out stains with the STAINMASTER Carpet Pet Stain Remover. 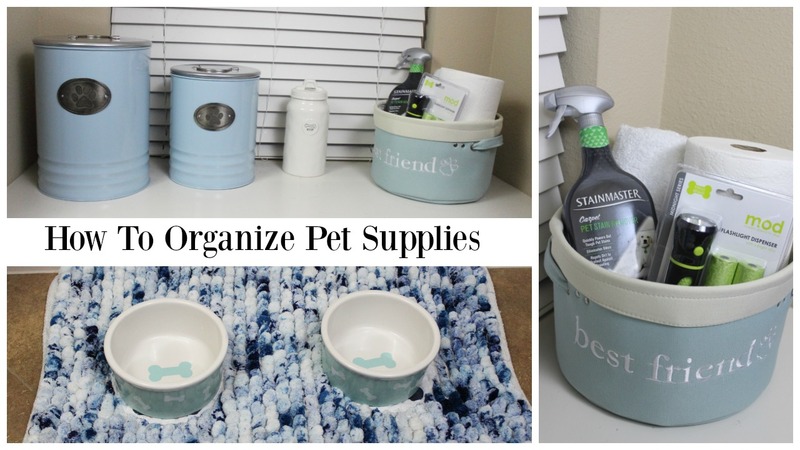 Making a cleaning basket like this would be the perfect gift for a friend or neighbor who is adopting a new pet too! All in all JoJo’s nook couldn’t be any more perfect. How do you organize your pet supplies?